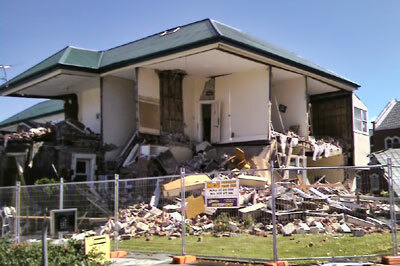 St Mary’s presbytery Manchester Street, Christchurch, badly damaged in the September and February earthquakes has now been demolished. What was left of St Mary's presbytery. Mrs Adams office was on the bottom floor, to the left of the front door. Mrs Joan Adams, the parish secretary was inside the building at the time the earthquake struck. In conversation with the Provincial, Fr Brian Cummings, Mrs Adams said she considered herself most fortunate to come away with only a few scratches and bruises. The Marist community had not been able to live in the presbytery since September and none were in the presbytery during the quake. During a national state of emergency give Civil Defence Emergency Management, National Controller, John Hamilton, has the authority to direct and coordinate the disaster response. Mr Hamilton has ordered the demolition of any building which poses a safety risk and with the parish school nearby the remains of the presbytery were bulldozed. The Society has staffed St Mary’s for 125 years and has occupied this particular presbytery for over a century. Inevitable as demolition was many Marists and parishioners are sad to see the end of a landmark in both Christchurch and the province.